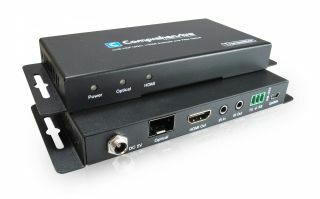 The What: Comprehensive Connectivity Company has launched the CHE-HDF18G01 - Pro AV/IT HDMI 18G Fiber Extender TX/RX Kit for distribution up to 3300 feet, featuring a compact design for flexible installation. The What Else: Comprehensive’s CHE-HDF18G01 HDMI over fiber extender supports 18G, resolutions up to 4K60, and is HDMI 2.0 and HDCP 2.2 compliant. This extender is designed to convert a full HDMI signal to a fiber signal, which can be transmitted over 3,300 feet using single-mode fiber cable or 1,000 feet over multi-mode fiber cable. Included are two IR receivers and two transmitters, allowing for bi-directional infrared control and supports RS-232. The Bottom Line: Comprehensive’s CHE-HDF18G01 HDMI over fiber extender is particularly well suited for lecture halls, retail sales displays, and anywhere in between. All components are RoHS Compliant and come with a three-year warranty.